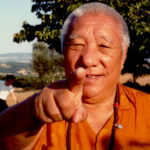 For many years now, the Shambhala community has been involved in something like a love affair with Khenpo Tsultrim Gyamtso Rinpoche, the extraordinary Kagyu yogi/scholar who reminds us every time we see him – with his songs, his teachings, and by his delightful presence – that everything is dependently arisen mere appearance. You should type things in this outer ground of all: the computer. You should store things in your inner ground of all: your base consciousness. You should know that all of the appearances of samsara and nirvana manifest from the ultimate ground of all: the true nature of mind. Know that everything is dependently arisen mere appearance. KTGR: (in English) What is your name? KTGR: What is your practice? KTGR: What is your question? WF: Sir, I am gathering stories from people who knew Chögyam Trungpa Rinpoche. I’m compiling these into an oral history of his life. My passion is to tell the life story of Chögyam Trungpa Rinpoche as completely as possible. Since his death, you have been one of the main teachers who have carried on the work of teaching his students. Even though you perhaps only met him a few times during his life, I feel that you may know him in a unique way through his students. So that’s why I’m here today. I would like to ask you to speak about Chögyam Trungpa Rinpoche, about his life and his teachings. I have taught a lot at what were once the Dharmadhatu centers and now they are Shambhala Centers. Whenever I go to these centers, my awareness feels very bright and clear. This demonstrates to me how excellent the connection is between Trungpa Rinpoche and his students, how much faith the students have in Trungpa Rinpoche, and how great Trungpa Rinpoche’s compassion and blessing were for his students. When I go to these centers, vajra songs of realization naturally come to mind. To me, that is a manifestation of Trungpa Rinpoche’s great blessing. I think that this blessing comes mainly from how much faith the students of Trungpa Rinpoche have in him. Now the older students of Trungpa Rinpoche are helping guide the younger students on the same path that they followed and that is an excellent way of serving their lama and shows how wonderfully Trungpa Rinpoche trained them. Trungpa Rinpoche laid out very clearly the stages of the path of study and practice for the Buddhist path and the Shambhala path and bringing the two together. He gave extraordinary teachings about the practices and the view at every level. The older students, his direct students, worked very hard to practice on that path and to translate all of the texts associated with the practices of that path. Now it is so easy for the new students because the older ones have blazed the trail. There are so many older students who can teach and help the new students along. I think the new students are so fortunate; this is my opinion. The new students are like people who drive on the highways in the West. The highway has been built and they don’t have to have any doubt about which way to go, they just get on the highway and they go. They are incredibly fortunate to have this opportunity. WF: Sir, did Trungpa Rinpoche also blaze a highway for the Tibetan teachers who came to the West after him? 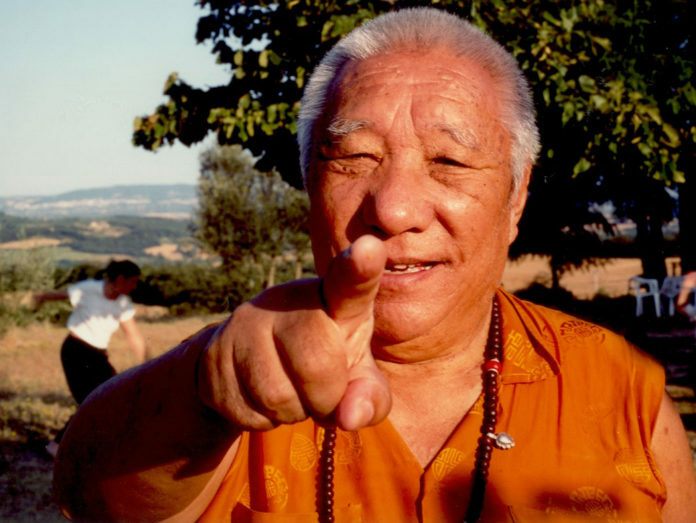 Is the work that he did beneficial to yourself and the many Tibetan teachers who are now teaching dharma in the West Has he made your job easier? KTGR: [Laughs] Definitely! Because the one who mainly spread the vajrayana in the West was Trungpa Rinpoche. By doing so he made it very easy for future lamas to come here and teach. You are absolutely right. WF: In what way did his work prepare the ground for yourself and other teachers? KTGR: And the students, the original students, also deserve credit because these students were the first to learn the forms and structure of the different practices, and to translate the texts. Now the community of students is guided by the Sakyong Mipham Rinpoche who is the son of Trungpa Rinpoche’s enlightened body, and the son of his enlightened mind. That is extraordinary and at the same time, it is part of a very sound tradition. If you look at the Sakya tradition and the Mindrölling tradition of the Nyingma, the one who carries the lineage of the father yogi is the son of both the father’s enlightened body and enlightened mind. When a realized yogi like Trungpa Rinpoche conceives a child, there is no way an ordinary sentient being could take it, to be in the womb of the mother. So the only ones who could take that, the only ones who could do that are extraordinary beings themselves. That is what Sakyong Mipham Rinpoche is. He is extraordinary. He is not like an ordinary tulku, not like an ordinary emanation. He is more extraordinary than that because he is both the son of Trungpa Rinpoche’s enlightened body and the son of his enlightened mind. So he is extraordinary. You also have all the acharyas, Trungpa Rinpoche’s senior students. They are helping to spread the teachings of Trungpa Rinpoche to so many different people. That is also extraordinary and it is not a static situation. The acharyas will grow old and they will be replaced by new teachers and the newer students will become older students and they’ll help to guide more newer students. So, therefore it is a good tradition. I have traveled all over the world teaching the dharma and this is my experience. Even in Australia and New Zealand there are Shambhala Centers where the older students are helping the younger students. The younger students are so fortunate because the older students have blazed a trail for them and they can practice on it just like somebody driving down the freeway. I think it’s possible in the future that the Shambhala tradition will even spread back to Tibet and China. Since the Shambhala tradition makes the dharma available to people who work, it makes it available to everyone in the modern world. In a communist country like China, the monastic tradition, where people give up work to practice, is only available to a very small number of people. The communists think that when there are too many nuns and monks who are not working, other people have to support them. They think that it is not beneficial; that it is harmful to the society. So they put limits on the number of monks and nuns. But the Shambhala tradition, on the other hand, encourages people to work and practice dharma together. That can only be of benefit to the country. When people practice according to the Shambhala path, their minds become gentle and good, their conduct becomes good and upstanding. How could that hurt the country? For example, look how many people came into Shambhala Centers in the old days and even now as hippies. You took drugs, [KTGR laughs] didn’t listen to your parents, didn’t want to work, and acted irresponsibly. Now, as a result of practicing on the path, you have been transformed and have became good people who are responsible [KTGR laughing during the translation] and respectful towards your parents and others. Now your parents like the Buddhist tradition too and that is of benefit to everybody. When people develop good minds and good conduct, that helps the country, helps the society, and makes everybody happy. When you can practice the dharma while working then lots of people can practice. Even if everybody on the planet wanted to practice the dharma, they could, as long as there is a way for them to practice while they work. The Shambhala path of Buddhism makes it so easy because all the stages have been laid out; it is available to everybody. That’s how it is. That’s good isn’t it? WF: That’s wonderful! In telling the story of Trungpa Rinpoche’s life, what would you say is the unique quality of Trungpa Rinpoche The unique quality in Tibet before he came to the West? KTGR: That’s something you should ask the people in Surmang, because they know the story of Trungpa Rinpoche’s life in Tibet. The western students know the story of what he did in America and Europe. The story of how he escaped from Tibet and the difficulties he encountered as a refugee, Trungpa Rinpoche himself has told in Born in Tibet. Trungpa Rinpoche’s famous because he gave the empowerments of the Rinchen Terdzö when he was only 13 years old. So he’s renowned for having brought his prajna to perfection at a very young age. I am not sure, but I think he’s probably the only one who did something like that at a young age. That’s how it is. WF: I feel that we, his western students, can tell the outer story of his life. But I worry that we may have difficulty understanding the deeper meaning, the inner and secret stories of his life. Can you shed any light on the inner story and the secret story of Trungpa Rinpoche’s life? 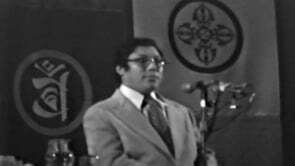 KTGR: The secret aspects of Trungpa Rinpoche’s life story are revealed by Trungpa Rinpoche himself, at different times, to different people, in different ways. It’s difficult to come up with one version of it. It’s something that is revealed to people at large gradually over time. WF: So we should wait? KTGR: [Laughs] A little bit more time probably needs to pass. KTGR: Right, so you know that. That’s important. That’s Trungpa Rinpoche’s own experience of high level of realizationthe level of realization of one who is free from ordinary activity, free from hope and fear, free from adopting and rejecting. There are also all the things that Trungpa Rinpoche wrote and said publicly and privately; you have to examine all of that for yourselves. Some of his writings from Tibet, you have to understand, were written to be in harmony with the way Tibetans think. So you have to decide what to do with that. For example, in some lamas’ songs of realization and in their writings, they criticize monks a lot. The monks that live in the monastery, they criticize them a lot, because they are looking after the monks all the time. So that’s why they criticize them a lot. KTGR: Once in Boulder and once at Shambhala Mountain Center. It was probably Boulder. While not existing they appear. My experience of meeting Trungpa Rinpoche was an experience of the wonder of appearance and emptiness—the wonder of having all thoughts be self-liberated. Since he himself is a yogi free of ordinary concepts, then my experience of meeting him was an experience like that. There wasn’t a lot to talk about. That’s good, so now you should write this life story slowly, carefully. Thank you to Ari GoldField, who was the Tibetan/English interpreter for this audience.